Not all socks are the same and buying the wrong pair can ruin your trip. Work out how to get the best technology and comfort for your feet in the snow. The humble ski sock may not seem like an entirely vital part of your ski wardrobe, but get the wrong fit and your day on the slopes may not go as smooth as you'd hoped. Crafted with synthetic fibres, or wool, ski socks provide skiers and snowboarders with extra warmth, comfort and moisture control. There's also extra support and cushioning to reduce fatigue... and keep you riding for longer! If you're looking to have a confident day riding on the slopes, the correct fit is important. Pick a sock that is too small and you can experience discomfort and a tight, restrictive feel. A sock that is too large will pinch and rub, causing painful pressure points. For ergonomic socks, it's important to make sure that the built-in support is in the correct area of your feet. The easiest way to secure the right size is to use your normal shoe size. If you are between sizes, it is recommended to choose a smaller size for a tighter, more performance-lead fit. If you feel as though you need two pairs of ski socks for a correct fit, this is more likely to lead to blisters and shin splints. It is recommend to invest in correctly fitting boots with a moulded insole and volume-reducing insole rather than relying on ski socks to make the boot fit. For the most basic sock, the tube sock is available. It is a simple design that consists of a long, elasticised tube with a toe cap sewn to the end. 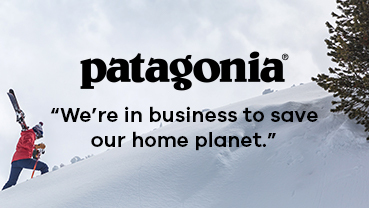 They offer simple comfort at a cheaper price tag and are best suited for occasional skiers and snowboarders. For optimum comfort and performance, the anatomically shaped ergonomic sock is your choice of ski sock. They have a specified left and right foot with an angled toe box to accommodate the longer length of the big toe. They offer specific shaping around the arch, instep and ankle. For less stretching and bunching of fabric, ergonomic socks tend to be available in half sizes. Compression socks use the latest compression technology with elasticised properties. The socks are designed for better muscle performance, a quicker recovery and a reduction in fatigue. In order to get the blood flowing faster, they fit very close for precise control. Most commonly, materials such as polyester, nylon, acrylic, elastic and Lycra are used in ski and snowboard socks, sometimes with moisture-wicking abilities to keep sweat away from skin. Polyester ensures reliable moisture management with a comfortable soft touch. It is one of the most commonly used fabrics in ski socks due to its superior level of comfort and thermal properties. Nylon may be used to reinforce high wear sections such as the heel or shin, due to its durable qualities. Odours are also prevented thanks to nylon's antibacterial qualities. Acrylic is lightweight and soft to touch, and therefore may be used as a substitute to wool. Acrylic is also able to retain its shape, perfect for avoiding wrinkling or bunching. Elastic and Lycra are also used to help retain shape, preventing bunching. Wool is the only natural fibre with moisture-wicking abilities. Thus, a wool sock will be durable, comfortable and dry. However, wool socks tend to have more bulk and less elastic memory, meaning wool ski and snowboard socks may droop over time. For exception comfort, warmth and breathability, Merino Wool is the construction to choose. It is also able to naturally and successfully wick away moisture, retain its shape and prevent build up of odour. Lightweight: For the highest level of performance, pick a lightweight ski sock as they allow energy to transfer from your legs to your ski or snowboard, increasing control. They are also best for warmer weather conditions, such as spring skiing, and for riders with precision fitted ski boots. Sometimes lightweight ski socks are labelled as 'Race' socks. Midweight: Probably the most popular, midweight ski socks provide a good balance between warmth, comfort and performance, with padding in all areas. Heavyweight: Heavyweight ski socks provide a more comfort-orientated fit. With this in mind, they are most suited to beginners or occasional skiers and snowboarders who require a 'fix' for a bad fitting ski boot fit. For arch support, ski socks often provide a tighter or thicker fabric around the foot to hold shape more naturally. This prevents distortion and an unnatural flex where it matters most when inside the boot. For extra comfort while riding, ski socks also provide ankle or Achilles support. For high impact or high pressure areas, such as the ankle and instep, cushioning is essential in ski and snowboard socks. Cushioning also helps to prevent shin splints by providing more padding on the shin. Similar to cushioning, compression also helps in lessening fatigue and allowing you to ride longer. Compression applies pressure in all the right places to fasten recovery time and encourage circulation to improve comfort and warmth. Socks may come with a reinforced footbed to heighten durability. Often a polypropylene platform throughout the sole, a reinforced footbed helps to prevent odours and is used to improve insulation and drying time. A ski sock's toe seam may be flat-stitched to prevent chafe and bunching. This ensures an overall better fit inside your boots. Sometimes ski socks have different constructions. For example, an alpine ski sock will have alternative padding to a ski sock designed for ski touring. Although it is not essential to buy a ski-specific sock, it may help for a more comfortable fit. 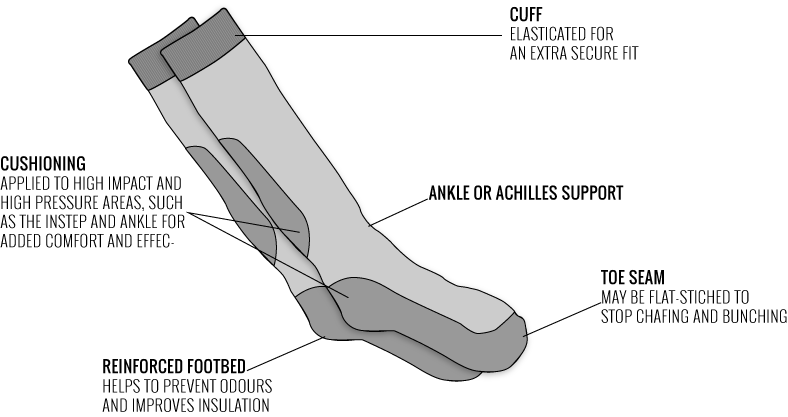 If a sock is snowboard specific then it will tend to have padding and cushioning around the calf area, as this is what feels the most pressure when riding. They may also have cushioning on the instep and shim to help decrease pressure when the straps and laces are cranked super tight. Men and women's ski socks tend to be different in design. For example, a women's ski sock will generally have a shorter leg section.